Congratulations to Jai Kumar, Laura Brugioni, Adolfo Leiva, Julie Lamson and Michiko "Misha" Kealoha who were recognized with the ‘Above and Beyond’ award at Wednesday’s Board of Trustees meeting for their work to create of a “Grab and Go” meal program to provide low cost, nutritional meal options for students. The Cañada College Bookstore, in partnership with the Associated Students organization and the campus SparkPoint Center, developed a nutritious, brown-bag meal for $6.00; the meal is also offered for dinner at $3.00 after 4 p.m. at the campus Bookstore and Pony Espresso. After the program was launched, EOPS adopted the ‘Grab and Go’ initiative to support program participants. Additionally, a breakfast meal program has been developed for students for $3.50 per meal. 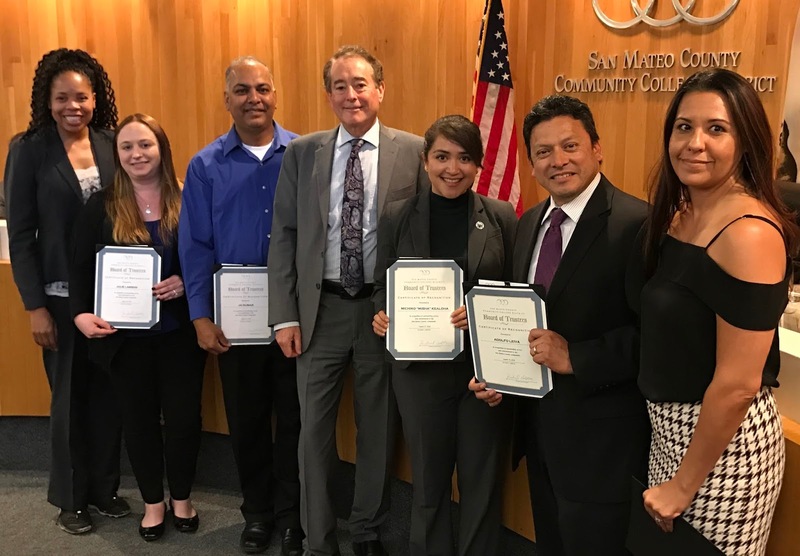 The program is now being viewed as a model that can be ported to Skyline College and College of San Mateo. Thank you Jai, Laura, Adolfo, Julie and Misha for your leadership in addressing a growing student support need.